The ambulator is a different way of thinking about websites. Instead of having a row of isolated pages, the Ambulator displays fragments of several web pages simultaneously in the same space. A web site and a page in a magazine may look pretty much the same, but they are not. The structure behind them is different. Form and content of a magazine are glued together through the process of printing. But on the web, form and content can easily be separated. Images can be detached from the text, text can be isolated from the layout. Ambulator is an internet agent that makes use of these possibilities. It collects text and images from different web sites and creates a network visualisation and a fluid, dynamic collage out of this web material. After the user has specified a keyword, the ambulator searches the internet for web pages that are related to the keyword. It then takes a chunk of text from one page, an image from another and displays text and images on screen. So the ambulator creates a new context by bringing together text and images from different web sites. After a while, the screen is filled up with words and pictures. Every object on screen relates to a web site on the internet, it always remembers where it comes from. The objects are capsules of information that with a click instantly bring you to the web page they relate to. During the search process, the ambulator also collects all new URLs it finds. Following these URLs, the ambulator can continue the search-and-display process. New web pages are searched, more text and more images are placed into the collage. The effect of this process is that the ambulator starts to drift. After a while, the material that is displayed on screen may have moved away from the specified keyword. The next iterations of ambulator lead to the degree show project at the RCA. The ambulator was connected to an internet browser and was able to tracing the movements of the user through the web. I created a browsing environment consisting of three different screens. The centre screen was used for the web browser. The one on the left visualised the movements of the user and showed visited and unvisited pages within a domain. The one on the right generated a fluid collage of text and images the user came across. It also pulled text and images from pages that the user had not visited yet - so it was possible to glimpse beyond the current web page. Above you can see a screen shot of the setup of ambulator 3.0. The application is tracing the movements of the user on a map. 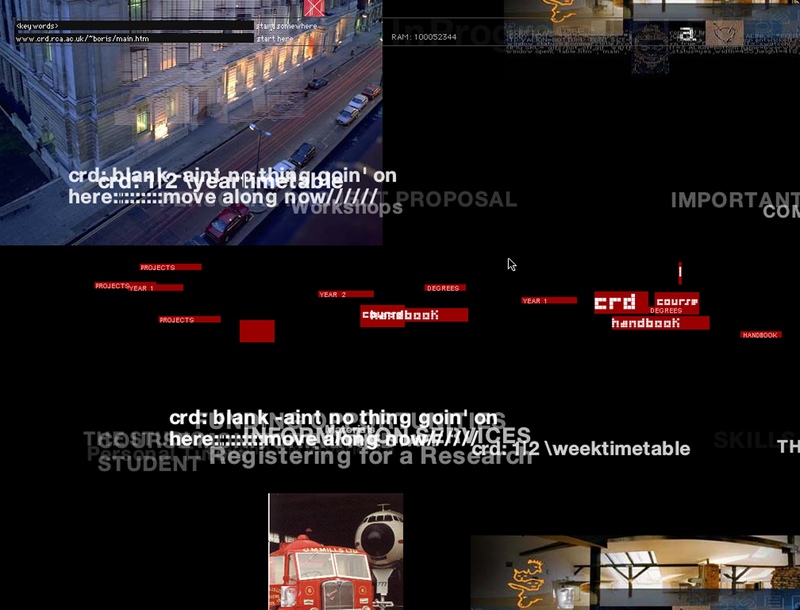 At the same time, it generates a fluid collage of text and images the user comes across. The ambulator reveals the smallest units a web site is build of. It reminds us that nothing on the web is fixed, things can be separated and joint up again, space has no meaning. The ambulator links together objects that have not been linked by anyone. It automates the creation of hyperlinks and breaks up the isolation of a single web page.